Semi-attached house in Saint Rémy de Provence. ask us pictures because the house is very beautiful. The house mixed with an other house can receive until 12 persons. -	All the month of october. The measure of the swimming pool are 11*5. There is two terraces out: one in front of the house and an other one in front of the garden. Inside: You will find a beautiful furnitures made by the owner who was carpenter. All the house excepted the kitchen part have hardwood floor. 2 bedrooms: one with double bed and two simple bed that can make a double bed. Bathroom with toilets, faucet, bidet and shower. Our whole family of four had an absolutely lovely and extremely comfortable stay at this holiday home this summer. The house was well equipped, absolutely beautiful, (even nicer than appears in the photos), very private and had a lovely garden and swimming pool. The beds and pillows were extremely comfortable, which is hard to find in a holiday rental! The hosts were just wonderful and very welcoming and attended to all our needs, even giving us their own asthma inhaler when we needed it for our daughter. In terms of location, you could not fault this spot as it is only 5 minutes to St.Remy de Provence and close by car to many other beautiful villages, Beaux, Gord, Roussillon, Isles sur le Sorgue and many many others and is a great location from which to explore Provence. The house is much nicer than in the photos. For us was a great vacation. This jewel of Provence. We are fascinated by the place. Everything was great. Excellent, clean pool with warm water. Beautiful, well-kept garden, surrounded by flowers. The fragrance of flowers. We fell in love with this place. Secure parking. Possibility of biking. The house is perfectly attuned, that would make walks in Provence. Such lovely, kind hosts. In the kitchen everything is comfortable and has everything you need. Good Wi-Fi. Very comfortable beds. Very comfortable mattresses. This is the best choice in Provence. We will definitely return. We are so glad to know that you spent lovely time in our house. We do our best to make you spend good time in our area of Provence. Hope to you again soon. It was a pleasure to meet you. Holydays House is a charming, clean, well-maintained property with everything you could need for your stay and as advertised. The owners, together with their daughter were delightful, friendly hosts and made us feel more than welcome. The use of the swimming pool as well as the barbecue area was most welcome as were the little 'extras' of local olive oil, wine, fruit and vegetables as well as a bunch of lavendar from the garden for both me and my daughter in law at the end of our stay. 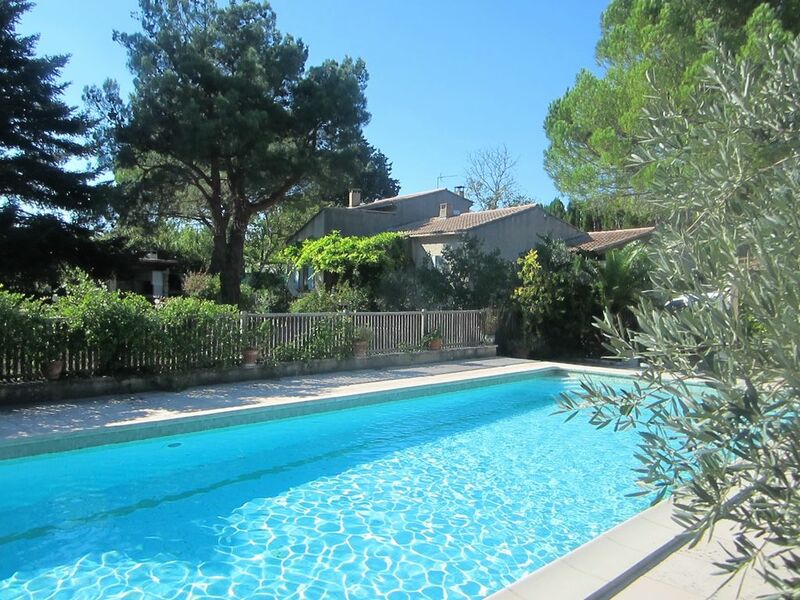 The property is situated in a very beautiful part of the country and just a short distance from St Remy de Provence, with it's wonderful side streets and magnificent restaurants, notably La Cigale and L'Industrie in St Remy. Holydays is a great base from which to visit the area - we would especially recommend Gréoux les Bains in the National Park, Van Gogh's bridge at Arles and of course Avignon. We would not hesitate to recommend this property to anyone whether for just a relaxing break or a sight seeing base. Thank you so much. We are so glad that you appreciate your stay. We really appreciate our discussion and exchange that we had. You are such wonderful people. La maison est très jolie et décorée avec beaucoup de goût. Mais surtout très belle rencontre avec Mr et Mme BRES au plaisir de les revoir bientôt. Wir verbrachten Ende August zwei Wochen in dem sehr schönen Ferienhaus der Familie Bres. Es hat einfach alles gepasst, wir haben uns sehr wohl gefühlt. Das Haus befindet sich etwas außerhalb des Zentrums an einer Landstraße (Verkehrslärm könnte den einen oder anderen stören, uns hat es nichts ausgemacht), für tägliche Besorgungen braucht man also ein Auto. Das Haus ist sehr hübsch und geschmackvoll eingerichtet, in der Küche ist alles vorhanden, man findet sich schnell zurecht. Ein Vorteil ist, dass alle Fenster Fliegengitter haben. Man merkt, dass sich die Vermieter viel Mühe geben. Das Haus entspricht der Beschreibung, es ist alles so wie auf den Bildern. Das große Plus ist sicherlich der tolle Pool, den wir jeden Tag mehrere Stunden genossen haben. Die Vermieter sind unglaublich freundlich, nett, hilfsbereit und sehr diskret. Man sollte allerdings ein paar Brocken Französisch können. Saint Remy eignet sich hervorragend, um die Provence zu erkunden. Alle Sehenswürdigkeiten sind nicht mehr als eine Stunde entfernt. Wir können das Haus auf jeden Fall empfehlen. Wir haben einen sehr schönen Urlaub bei Fam. Bres verbracht. Das Haus entspricht zu 100 % der Beschreibung und den vorherigen positiven Be-wertungen. Nous vous demandons un chèque représentant 30 % de la somme totale afin de réserver la maison. Les virements hors Union Européenne font l'objet d'un supplément pour frais bancaire de 25 euros.